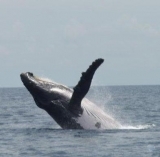 Whale Watching Panama is the only dedicated Whale Watching Tour company in all of Panama with expert Biologist guides. We have a 99% success rate in the Pearl islands with Humpback whales and 90% success rate with dolphins. Whale Watching Panama pioneered Whale Watching Tours in the country of Panama. Our Professional, friendly guides will help you to Connect, Communicate and Interpret the Behavior of the Whales and Dolphins you will encounter on your Whale Watching or Dolphin tour. We offer 1 day Whale watching and Dolphin & Snorkel tours from Panama city and 3 hour tours, 1 day tours and multiple day tours in the Pearl islands of Panama. We also offer 5 day spiritual Whale and Dolphin Wisdom Retreats that include topics such as meditation, animal communication, yoga, shamanism, etc. Whale Watching Panama is dedicated to responsible, respectful, educational and fun whale and dolphin watching tours. We are an Ambassador member of Whale Watching International- a group that promotes responsible whale and dolphin watching worldwide. Whale Watching Panama has been recognized as a responsible whale watching company by the International Whaling Commission and participates as an industry expert in the IWC's whale watch workshops. Whale Watching Panama's number one goal is Respect. Respect for the whales and dolphins, the ocean, the environment and humanity, so embracing and celebrating the Gay and Lesbian community is completely natural for us.